Yeah, give us the screen shots and we will do the rest. Please remove all accounts and ban this person of the game. He is being disruptive and offensive ever since the server merge. ;CHaracter name is Lara Croft. I will make report. But it would be good if you make some more screen shots of this player accusing, so i can use it as proof for SMs. 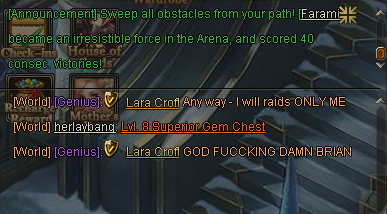 raid in raides so you report? 2019-4-19 17:14 GMT+8 , Processed in 0.064252 second(s), 52 queries .